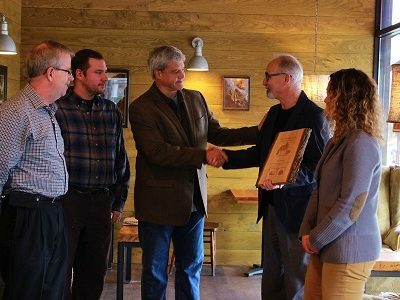 As a commercial supplier of Wisconsin Urban Wood, Wudeward Urban Forest Products saves urban trees from a fate of woodchips or firewood and returns them to the community at their highest and best use, feeding the local economy and environment. It is our mission to make the process of procuring, processing, selecting, and installing urban wood easy for architects, design professionals, contractors, and developers working on projects of any size. Below you’ll find various resources we’ve developed to aid in the planning process for the use of Wisconsin Urban Wood. Including Wisconsin Urban Wood in your project is as easy as making a few modifications to your master specifications. Download our recommended specifications to assist in your project planning. Wudeward Urban Forest products is an exclusive supplier of Wisconsin Urban Wood. Our lumber comes from our city streets, our county parks, and our own backyards. Read more in our brochure. Join our mailing list for periodic updates on events we are a part of, projects we are involved in, and important developments in the urban wood industry. View past newsletters to learn more. Follow Dwayne Sperber as he advocates to salvage wood from the urban landscape and works with clients to bring urban wood project visions to reality. Read a case study on how the DoMUS apartment complex in Milwaukee’s Historic Third Ward serves as a model for working with Wisconsin Urban Wood in large volumes.